Preparations continue, with James finalising the route and beginning to book hotels. Both of us are keeping up the training intensity. 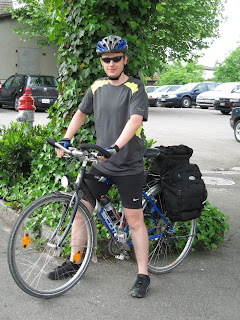 James took the bike (with fully-loaded panniers) on the train to Lausanne (on the lake of Geneva) and cycled back over 2 days (90 miles Saturday, 100 miles Sunday). It was his first experience of the full-scale distance and, apart from having the obligatory sore arse and wobbly legs, held up remarkably well for someone who hasn't cycled regularly since he was a teenager. Here he is in all his glory on his 'Old Lady Special'!